We know that appropriate light signals during the day and darkness at night are critical in maintaining key aspects of our overall health. In order to align our body clock, morning light is the most important signal for entrainment. Light in the morning also increases our levels of alertness, allowing increased performance at the beginning of the day. From mid-morning to early evening, high levels of daylight, allow us to regulate our sleep/wake timing and levels of alertness; whereas reduced light levels in the evening and a dark room with blackout promote sleep at night. The inability to provide building occupants with a good overall lighting environment can have subsequent impact on health and place a substantial burden on the individual, society and the broader economy. Bright lighting is generally believed to make people more alert, and well-daylit spaces are generally perceived by occupants to be “better" than dim gloomy ones (Mardaljevic et al., 2012). Daylighting has been associated with improved mood, enhanced morale, less fatigue, and reduced eyestrain (Robbins, 1986). Many studies show that the performance and productivity of workers in office, industrial, and retail environments can increase with the quality of light. Companies have recorded an increase in productivity of their employees of about 15% after moving to a new building with better daylight conditions which resulted in considerable financial gains (Edwards and Torcellini, 2002). Another study demonstrated that greater satisfaction with lighting conditions (both daylight and electric lighting) contributed to environmental satisfaction, which, in turn, led to greater job satisfaction (Veitch et al., 2008). Studies also show that daylit environments lead to more effective learning. It was found that students in classrooms with the most window area or daylighting produced 7% to 18% higher scores on the standardised tests than those with the least window area or daylight (Heschong, 2002). We have no evidence for “what is the necessary light dose?”, but we do have clear indication that the light dose needed is higher than interior light levels prescribed by electric lighting in standards and regulations. Studies suggest that higher doses would leave people with a feeling of being more positive about life (Espiritu et al., 1994), while social interactions immediately following exposure to over 1 000 lx were more co-operative and less quarrelsome (Aan het Rot et al., 2008). Windows are highly valued by office workers (Edwards and Torcellini, 2002). Surveys have shown that more than 60% of office workers would like direct sunlight in their offices in least one season of the year (Christoffersen, 1999) and believe that working under natural daylight is better for their health and well-being than electric lighting (Lighting Research Center, 2014). Employees working in offices highly value access to a window - indeed, they value it more than privacy in their office (Wotton, 1983). Several studies have shown that people prefer daylight to artificial lighting at work. This is often linked to daylight’s dynamic variation of intensity, colour and direction and the positive effect these have on our experience and mood (Christoffersen, 1999; Veitch, 2003). Canadian studies show that there is a general perception that daylight should be the primary light source for the sake of our health and well-being (Veitch, 1993, 1996). A few studies in dwellings show that natural light is the single most important attribute in a home, with over 60% of respondents ranking it as important (Finlay, 2012). A WHO survey involving eight cities across Europe, showed that individuals who report inadequate natural light in their homes have a greater risk of depression and falls (Brown, 2011). Building interiors should be designed in a way that permits the human need to be linked to the natural environment to be satisfied by minimising overshadowing and allowing distant views (Wirz-Justice, 2010). A natural view is preferred to a view towards the man-made environment, and a wide and distant view is appreciated more than a narrow and near view. A diverse and dynamic view is more interesting than a monotonous view. The content of the view can influence rental or cost price of hotels, dwellings and office buildings (Kim and Wineman, 2005). A view to nature may have a positive influence on people’s sense of well-being (Kaplan, 2001), better subjective health (Kaplan, 1993), higher environmental satisfaction (Newsham et al., 2009), better mood (Grinde and Grindal Patil, 2009), reduced health problems (Heschong Mahone Group, 2003), job satisfaction, recovery of surgical patients (Ulrich, 1984), stressful experiences (Ulrich et al., 1991), and seating preference (Wang and Boubekri, 2010, 2011). A study by Ariës et al. (2010) shows that views in offices independently judged to be more attractive were associated with reduced discomfort and, through the discomforting effect, with better sleep quality. There is some evidence that daylight exposure can affect postoperative outcomes in patients and, consequently, that daylight should be a consideration in hospital design. Ulrich (1984) reported that hospital patients with a view of green spaces, as opposed to those with a view of a blank brick wall, recovered more quickly from surgery and required less post-operative pain medication. Beauchemin and Hays (1998) found that patients on the sunnier side of a cardiac intensive care ward showed lower mortality rates than those on the less-sunny side. Another study determined that sunlight exposure was associated with both improved subjective assessment of the patients and also reduced levels of analgesic medication routinely administered to control postoperative pain (Walch et al., 2005). The importance of the amount of daylight in a patient's room indicates an impact on patients' length of stay; coronary artery bypass graft surgery patients' length of stay in hospital was reduced by 7.3 hours per 100 lx increase of daylight (Joarder and Price, 2013). Seasonal Affective Disorder is a depression-related illness linked to the availability and change of outdoor light in the winter. Reports suggest that 0.4% to 9.7% of the world's population may suffer from SAD, with up to three times that number having signs of the affliction (called sub-syndromal SAD (or S-SAD) without being classified as a major depression (primarily in Northern America and Northern Europe) (Rosen, et al., 1990). Light therapy with exposure levels at the eye of between 2500 lux (for 2 hours) or 10 000 lux (for 30 minutes) has shown to be an effective cure against SAD (Sloane, 2008). Exposure to daylight outdoors (~ 1000 lux) can also reduce SAD symptoms (Wirz-Justice et al., 1996). So, as seasonal mood disturbance is relatively common, the amount of daylight in our homes or workplaces can be of considerable significance – though the effective value of daylight will depend on the architectural design of a room and the facade (Pechacek et al., 2008). Light therapy can also be used to treat other depression-related symptoms (e.g. non-seasonal depression, premenstrual, bulimia). Another benefit of using daylighting for ambient and/or task illuminance in a space is that it can save energy by reducing the need for electric lighting. Several studies in office buildings have recorded the energy savings for electric lighting from using daylight in the range of 20-60% (Galasiu, 2007), but it depends on the lighting control system used, how well the space is daylit during occupied hours and the intended functions of the space. If no control system is installed, the occupant entering a space will often switch on the electric lights. Quite why occupants switch on or off the office lights is not always obvious, but it is even less obvious in a domestic setting, where demand for light is typically driven by human needs and wishes. In non-domestic buildings, official recommended illumination levels are defined for the spaces they illuminate. They are dependent on the type of space to be lit and the functions within it and are based on both the functional efficiency of anticipated tasks performed in the spaces and visual comfort (IEA, 2006). Typically guidelines and recommendations for light levels exist for communal residential buildings but not for single-family houses. Estimation of savings potential in domestic buildings requires a user profile, and models for switching on/off the lights. In a study by Mardaljevic et al. (2012), the French RT 2005 model was used. 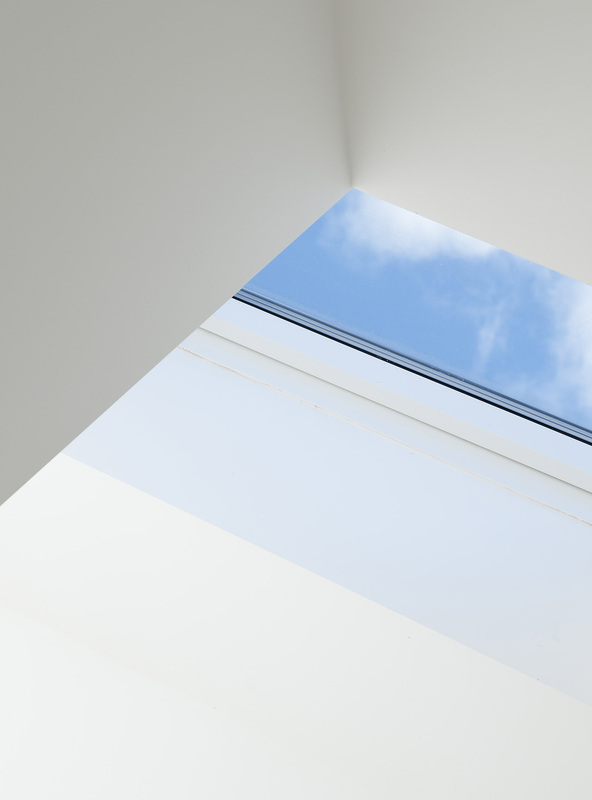 They analysed the potential for increased daylight provision for a house with or without skylight to save electric lighting energy at eight European locations. The study shows that increased daylight is estimated to reduce the need for artificial lighting by 16-20%, depending on the location and orientation of the house. See section 1.6.6. In LichtAktiv Haus in Germany, the electric lighting used in the kitchen and living room shows a significant tendency of being affected by the interior daylight level; the lights are typically switched on before sunrise and after sunset. There is a reasonable correlation between high daylight level and switching probability, while outside weather, the day of the week has less impact (e.g. family with children). Figure 1.4.1 LichtAktiv Haus. 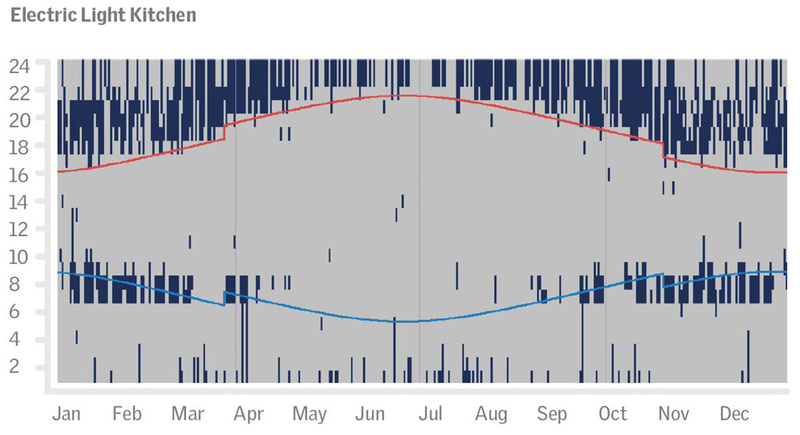 Temporal map of lighting use in the kitchen (2012), showing time of sunrise (blue) and sunset (red). Lighting use and sunrise/sunset depends on local time, which accounts for Daylight Saving Time (DST). 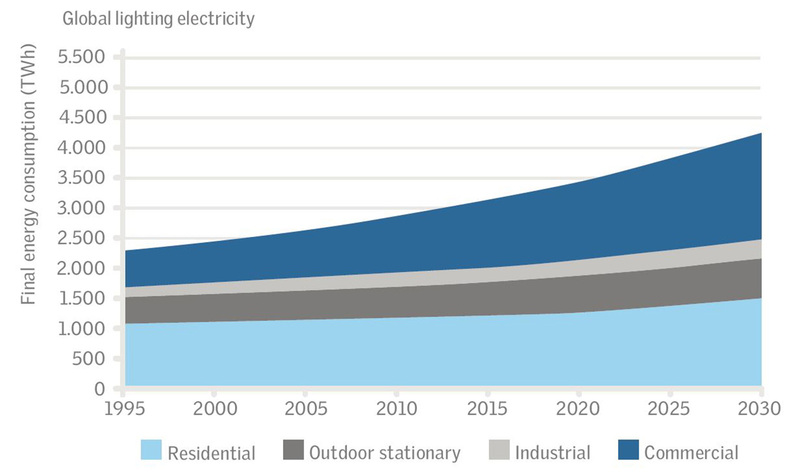 Figure 1.4.2 Global electricity consumption for lighting with current socio-economic trends and policies is projected to rise. The actual growth will depend on demand for artificial light and the efficiency of lighting technologies, just two of the factors influencing increased consumption (IEA, 2006). • Implemented daylight-saving time) and sometimes double DST. • Acknowledging credit for daylight measures in building codes. • Supported R&D and dissemination of daylighting practices and technologies. • Labelling and certification of windows. Increasing use of natural resources, such as daylight and air, in our buildings, through constructive use of windows in the facades and roofs, can influence our dependency on fossil fuels as well as reduce combustion of greenhouse gases. Lighting is one of the largest consumers of electricity and one of the biggest causes of energy-related greenhouse gas emissions. The amount of electricity consumed by lighting is almost the same as that produced from all gas fired generation and about 15% more than that produced by either hydro or nuclear power. Indoor illumination of tertiary-sector buildings uses the largest proportion of lighting electrical energy, comprising as much as the residential and industrial sectors combined. On average, lighting accounts for 34% of tertiary-sector electricity consumption and 14% of residential consumption in OECD countries. In non-OECD countries these shares are usually higher (IEA, 2006). Daylit environments facilitate better performance, productivity and learning. Light therapy with exposure levels at the eye of between 2500 lux (for 2 hours) and 10 000 lux (for 30 minutes) has shown to be an effective cure for SAD and other depression-related symptoms. Ariës, M. B. C., Veitch, J. A., and Newsham, G. R. (2010) Windows, view and office characteristics predict physical and psychological discomfort. Journal of Environmental Psychology, 30(4), 533-541. Boyce, P., Hunter, C. and Howlett, O. (2003) The Benefits of Daylight through Windows, Lighting Research Center, Rensselaer Polytechnic Institute. Brown, M. J., and Jacobs, D. E. (2011) Residential light and risk for depression and falls: Results from the LARES study of eight European cities. Public Health Reports,126 (Supplement 1), 131-140. Christoffersen, J., Petersen, E., Johnsen, K., Valbjørn, O. and Hygge, S. (1999) Vinduer og dagslys – en feltundersøgelse i kontorbygninger (SBi - rapport 318) Hørsholm: Statens Byggeforskningsinstitut. CIBSE Guide A. (2006) Environmental design. Chartered Institution of Building Services Engineers, London. Edwards, L., Torcellini, P. (2002) A Literature Review of the Effects of Natural Light on Building Occupants, National Renewable Energy Laboratory,U.S. Department of Energy. Espiritu, R. C., Kripke, D. F., Ancoli-Israel, S., Mowen, M. A., Mason, W. J., Fell , R. L.et al. (1994) Low illumination experienced by San Diego adults: Association with atypical depressive symptoms. Biological Psychiatry, 35(6), 403-407. Grinde, B., and Grindal Patil, G. (2009) Biophilia: Does Visual Contact with Nature Impact on Health and Well-Being? International Journal of Environmental Research and Public Health. September; 6(9): 2332–2343. Hathaway, W. E., Hargreaves, J. A., Thomson G. W., Novitsky, D. (1992) A study into the effects of light on children of elementary school age - a case of daylight robbery, Alberta Department of Education. Heschong, L. (2002) Daylighting and Human Performance, ASHRAE Journal,vol. 44, no. 6, pp. 65-67. Kaplan, R. (1993) The role of nature in the context of the workplace. Landscape and Urban Planning Volume 26, Issues 1–4, October, 193–201. Klepeis, N. E., Nelson, W. C., Ott, W. R., Robinson, J. P., Tsang, A. M., Switzer, P., Behar,J. V., Hern, S. C., Engelmann, W. H. (2001) The National Human Activity Pattern Survey (NHAPS): A resource for assessing exposure to environmental pollutants. Journal of Exposure Analysis and Environmental Epidemiology, 11(3), 231-252. Lighting Research Center (2014) Rensselaer Polytechnic Institute, Daylighting Resources – Productivity, http://www.lrc.rpi.edu/programs/daylighting/dr_productivity.asp (accessed: 2014-11-06). Mardaljevic, J. (2008), Climate-Based Daylight Analysis for Residential Buildings – Impact of various window configurations, external obstructions, orientations and location on useful daylight illuminance, Institute of Energy and Sustainable Development, De Montfort University. Newsham, G. R., Brand, J., Donnelly, C. L., Veitch, J. A., Aries, M. B. C., Charles, K. E.(2009) Linking indoor environment conditions to job satisfaction: a field study.Building Research and Information, 37(2), 129 - 147. Robbins, C. L. (1986) Daylighting Design and Analysis, New York: Van Nostrand Reinhold Company. Ulrich, R. S. (1984) View through a window may influence recovery from surgery.Science, 224(4647), 420-421. Ulrich, R. S., Simons, R. F., Losito, B. D., Fiorito, E., Miles, M. A., Zelson, M. (1991) Stress recovery during exposure to natural and urban environments. Journal of Environmental Psychology, 11(3), 201-230. Veitch, J. A. (2002) Principles of Healthy Lighting : Highlights of CIE TC 6-11 ‘ s, National Research Council Canada. Veitch, J. A., Newsham, G. R., Boyce, P. R. and Jones, C. C. (2008) Lighting appraisal,well-being, and performance in open-plan offices: A linked mechanisms approach.Lighting Research and Technology, 40(2), 133-151. Wirz-Justice, A., Fournier, C. (2010) Light , Health and Wellbeing : Implications from chronobiology for architectural design, World Health Design, vol. 3. Wotton, E., Barkow, B. (1983) An Investigation of the Effects of Windows and Lighting in Offices, International Daylighting Conference: General Procedings, pp.405-411.